Our Homes – Meet the Strippers! After more than 30 years in the furniture refinishing business, you might think Margery Smith and Rita Wagner have seen everything there is to see in the way of unique, broken and treasured furniture with a story to tell, but they say they’re still surprised on a regular basis. Through their business, The Strippers!, they’ve had customers bring them everything from well-loved and well-worn dressers and bedroom sets to dismantled medicine cabinets (“Give us a hint, what could this be?” laughs Smith, recalling that particular project and the puzzle pieces she was given). They have refinished pianos, pool tables and fireplace mantels. They’ve rebuilt table legs chewed by dogs, refinished kitchen cabinets on-site and they frequently hand-weave repairs to wicker furniture. The services they offer are far-reaching and impressive, considering their business started as a hobby. “We both worked for an insurance company, but in our spare time we stripped,” they laugh together. “We were buying pieces at sales and stripping and finishing them,” says Smith. “I always wanted to try a business and this was an interest, so when a space opened up, we tried it out.” She was the face of the business for the first five years before Wagner joined full-time too. At that time, in the early 1980s, many people were dipping their furniture to strip it of various finishes. This method was harmful to furniture, so Smith and Wagner offered an alternative: a furniture friendly method of stripping. They were the only ones in the region offering this service. It’s still their specialty, but they now offer so much more. Within a few years, The Strippers! started to offer classes, chair caning repairs and spray finishing, for which they needed a larger space, so they soon upgraded. Similarly, many customers were coming from Guelph and Cambridge and within a few years, the pair opened locations in both those cities, in addition to their Belmont Avenue location in Kitchener. They’re now located on Gage Avenue. Now, other people own the other two locations and take the same care with furniture, practising the same approach for which The Strippers! are known. Smith and Wagner focus on their Gage Avenue location where they are now seeing the children of some of their original customers bringing pieces in for a facelift. Good quality furniture lasts through generations, but styles definitely change. “We consult with our customers every step of the way,” says Smith. Just as there are many shades of white, there are different shades of walnut, for example, and it’s important to The Strippers! that their customers know exactly what they’re getting. Even still, they admit many people are completely stunned when they see their furniture transformed. “You think you know what it’s going to look like,” says Smith, “especially if it’s been in the family” – but repairs, cleanup and a fresh finish can make any piece look brand new and often even better than people dreamed. 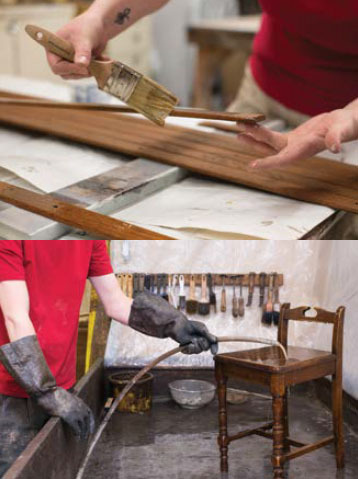 Whether a piece needs to be stripped, stained, refinished, painted, repaired or even polished, The Strippers! can make it happen. They also know their limitations (although there don’t seem to be many!) and they can recommend other professionals, such as upholsterers, for jobs that don’t quite fit their range of expertise. If their ability to transform or repair any type of furniture wasn’t enough, Smith and Wagner also own a second business. Customers started asking if various pieces in their shop were for sale. They realized there was potential to open a consignment store for good quality used furniture, so they opened Bits & Pieces Furniture & Décor Consignment Store directly across the street from The Strippers! Whether you find a new treasure at Bits & Pieces or you have a quality or meaningful piece at home that no longer fits your décor, trust The Strippers! to transform it into something fresh you can love again. They’re prepared for anything.